July 12 marks second anniversary of the ruling of the Permanent Court of Arbitration (PCA) in The Hague, Netherlands on the case filed by the Philippines against China on the territorial dispute in the Spratlys and the West Philippine Sea/South China Sea, causing problems in bilateral diplomatic and economic relations as well as increasing tensions in the region. 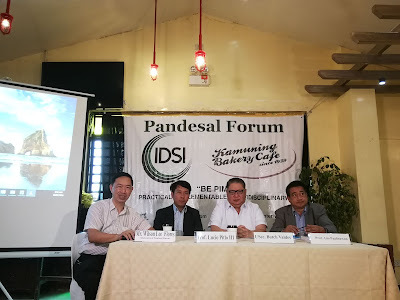 On July 9, the non-partisan Pandesal Forum with media in Quezon City had three geopolitics and diplomacy experts former Undersecretary Butch Valdes, former Philippine diplomat to Washington, D. C. Adolfo “Ado” Paglinawan and Ateneo de Manila University lecturer Lucio Pitlo III to discuss this issue, and they lauded President Rodrigo Duterte’s “pragmatic approach of normalizing diplomatic ties with China and engaging in bilateral negotiations without forsaking the Philippines’ territorial claims and without losing the PCA victory”. Moderator of Pandesal Forum is Wilson Lee Flores, owner of the 79-year-old Kamuninhg Bakery Café. The three experts said the Duterte administration’s wise and sober handling of the PCA decision and upholding an independent foreign policy of befriending all the world’s big powers USA, China and Russia have “resulted in lowering tensions in the region and contributing to peace in Asean as well as Asia”. Three geopolitics analysts recently said this is the second anniversary of the Duterte administration’s “successful high-level diplomacy and independent foreign policy which advance and protect the Philippines’ national interests without forsaking territorial claims”. Pagkalinawan and Valdes pointed out that the PCA isn’t a United Nations body and not a court, but an ad hoc arbitration mechanism similar to a local barangay hearing to arbitrate with two conflicting persons after which an unsettled dispute can thereafter be elevated to a real court. They pointed out that the PCA also has no enforcement mechanism and that the other party, China, had refused to participate. Valdes and Pagkalinawan concluded that the previous Aquino administration’s filing of this case at this PCA without China’s participation had therefore rendered the ruling as “more for propaganda purposes rather than as a way for resolution of the territorial dispute”. Valdes and Paglinawan both lauded the Duterte administration’s “wise, pragmatic and high level diplomacy” approach to setting aside the PCA decision, but not forsaking it, while normalizing the ancient bilateral diplomatic and economic ties of the Philippines with the world’s No. 2 economic superpower China. Valdes and Pagkalinawan agreed with President Duterte’s openness to possible joint exploration of the disputed area and joint development of any resources in the Spratlys, pointing to the Philippines’ joint venture with Western countries in the gas project of Malampalaya, Palawan as an example. Academic scholar Lucio Pitlo III said bilateral negotiations between the Philippines and China has good precedents based on two countries’ histories. He said the Philippines has successfully, peacefully settled with Indonesia on our maritime borders after 20 years of patient, bilateral negotiations, while China has also successfully concluded its border demarcation boundaries with 13 countries out of 14 neighbor countries that have land borders with China such as Russia, Mongolia, North Korea, Vietnam, Laos, Myanmar, India, Bhutan, Nepal, Pakistan, Afganistan, Kazakhstan, Kyrgyzstan and Tajikistan. As of today, China have settled its border disputes through years of peaceful, bilateral negotiations with 13 of the 14 countries (all except India).